Jayalalithaa’s long drawn out corruption case ended with a seemingly unexpected but heartening verdict for her. As the expected did not happen, her political enemies have ganged up in a rare unity demanding appeal to dethrone her. The anti-Jaya parties are pretty well aware of her massive popularity in Tamil Nadu. Jayalalithaa’s bold and charismatic leadership, which are all, lacking among the leaders of opposition parties. DMK Chief Karunanidhi who is a tainted corrupt leader is sitting with a wealth of hundreds of crores. Besides his newphes Marans are also facing charges of corruption along with DMK chief’s wife and his daughter Kanimoli. There is no doubt that Tamil Nadu needs Jayalalithaa for the sake of its people. Above all Modi needs Jayalalithaa’s support in parliament to ensure his survival. In Raja Saba, Modi desperately needs Jayalalithaa’s member’s votes to pass any legislation introduced by him in the house. Already the president Muharjee has warned Modi not to resort to the emergency provision to pass a legislation, but advised him to get it passed by both the houses. Modi’s quick congratulatory messages on her birthday and acquittal demonstrate the depth of his need for Jayalalithaa to ensure his government’s survival. 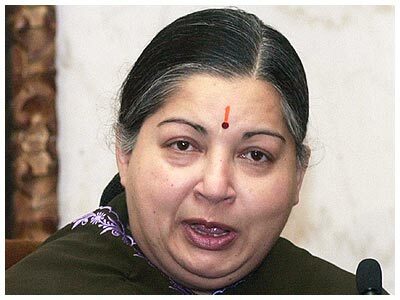 As far as Tamil Nadu is concerned, she has passed many popular bills focusing on the poor and low-income population. She appears to have learnt the pitfalls of political power resulting from the abuse of position. Besides, she is a bold leader who does not fear the centre or anyone else in taking whatever steps necessary at the opportune time. For instance, she boycotted Modi’s swearing in ceremony due to the presence of genocidal Mahinda, which step only Jayalalithaa can take in Tamil Nadu as chief Minister. As for the Eelam Tamils are concerned, she has neither wavered nor gone into a shell to express her solidarity with the Tamils after the genocidal war in 2009. DMK Chief Karunanidhi deliberately blacked out the media during the war and never expressed his condemnation while the massacres were in full swing. Karunaidhi’s priority during those horrible days was his daughter, Kanimoli and how to secure a cabinet post for her from Sonia Ghandi. Karunaidhi’s three-hour Satyagraha drama, after a hearty idli breakfast, can only be excelled by an Oscar winning actor. Though better late than never, Jayalalithaa passed legislations in the Tamil Nadu state legislature demanding an independent international investigation and a referendum involving all the Tamils living in Sri Lanka and outside Sri Lanka to express their opinion as to self-rule or separation. As far as the TNA is concerned, TNA is plodding and wandering, while aimlessly drifting like a rudderless boat confusing themselves and the Tamils. Sampanthan’s conciliatory actions like hoisting the Sinhala flag, enjoying the independence day celebrations, acceptiong the insults hurled at Wigneswaran by Ranil have so far not produced any tangible and forward steps for the Tamils from Maithiri’s government. Undoubtedly, Chelva would have turned in his grave for the above weak-kneed bending steps of Sampanthan. TNA also missed the opportunity to press John Kerry strongly for a solution based on self-rule rejecting the 13th amendment. It was reported in local media that when Suresh Premachandran raised this matter, Sampanthan instantly silenced his mouth in fornt of John Kerry. One outcome of John Kerry’s visit is that USA has dropped the demand for an international investigation and has agreed to Maithiri’s internal investigation with assistance from outside officials UN or otherwise. John Kerry has instead put the ball in TNA’s court to convince the Maithiri government for the solution of Tamils’ problems. The result is Maithiri and Ranil succeeded diplomatically while TNA returned home empty and deflated. With general elections looming ahead, Tamils and TNA will be back to square one. With Sinhala parties fighting to capture power, the Tamils and their problems will be put in cold storage. As there is not other strong alternative force for TNA in the North and East, TNA will remain confident in securing victory in the elections. However, Tamils are weill informed and should voice their opposition to TNA’s timid and callous approach with the Sri Lankan government. A scorned woman and a wounded tiger will never meekly submit and surrender to their tormentors, but they will only fight back with more courage and determination. TNA is now left with one of the two options, as Nelson Mandela put it, “Either fight to achieve your rights or submit to be ruled with subjugation”. We hope sanity will prevail to save the abandoned Tamils and restore their pride and dignity. Having failed to maximize the opportunity arising from the 19th amendment to include provisions for settlement, TNA should now reach out to solicit the support of internations community and not confining to localized empty politics and heaping trust on Sinhala leaders. David Cameron, a strong supporter of Tamils is back in power and also Jayalalithaa who is now acquitted in the corruption case. Jayalalithaa’s resolutions in the state assembly remain ignored by Modi and time is opportune for the Tamils and TNA to express other solidarity with Jayalalithaa. Like Sritharan, a TNA M.P. who welcomed her acquittal, holds the leverage with Modi, and so Jayalalitha holds the key to press Modi to engage Sri Lanka for a dignified settlement. Undoubtedly Jayalalithaa stands taller than the other Tamil Nadu political leaders for her courage, will power, and determination. It is high time TNA endorses her steps and extend support to her moves, rather than waiting for opportunites to come instead of creating and using opportunities to redeem the lost status of Tamils in Sri Lanka. The government of Maithiri’s recent move to return the 800 acres of land in Sampoor to their owners is another positive step which was achieved due to the relentless and continuing protests, agitations, and demonstrations staged by the Sampoor people and TNA should take notice of this success achieved to popular rising and the saner step for TNA is to resort to mass and popular agitations to obtain justice for the Tamils and not to claim credit for this success which squarely belongs to the Sampoor people only. Sampanthan in an interview with Canadian media when asked to comment on the 1985 Kumudhini massacre of innocents by Sri Lankan navy, he was laboring to justify it by hinting that Tamil groups have been also accused of these violations such is the depth of his love for Maithiri’s government and Sampanthan is weel aware of the face that Kumudhini massacre was one of the 156 massacres carried ouy by Sri Lankan security forces from 1952 to 2009, and in 1985 or before Tamil groupls never indulged in any massacres except targeting the security personnel. It is pathetic to see people like you believing in Jaya and Modi to win back the rights of the Tamils of Sri Lanka. Had not the LTTE spurned the opportunity provided by Rajiv Gandhi and later killed him SL Tamils would would have won back their rights long ago. Rajiv is one Indian leader who was genuinely prepared to make the SL government concede the rights of the Tamils. Indo-Sri Lankan Accord was just the first step in that direction which indeed was a vital step because it made the SL government recognise North East Sri Lanka as the historic habitation of the Tamil speaking people and led to the temporary merger of Northern and Eastern provinces into one administrative unit. Had the LTTE accepted it and went along with Rajiv, Tamils would have got real autonomy short of a separate state. That was not to be because people like you who went to Parliament to represent Tamils became silent accomplices to the misdeeds of Pirapaharan. You are now praising Jaya as if she is an “Avathar” who will deliver your Eelam with the help of Modi. In the recent past your avathar Jaya had been mouthing slogans in support of the SL Tamils only to win votes of the Eelam sympathisers in TN. She will never support wholeheartedly the cause of the SL Tamils. If she is really interested in the welfare of the SL Tamils she would have at least improved the living conditions of the SL Tamil refugees in TN as its Chief Minister. You are no different from your former TNA colleagues though you now accuse them of surrendering to the Sihala nation by hoisting the SL national lion flag. They too depend on the so-called international community (meaning US and India) to deliver. By the way, now that President Sirisena is going to dissolve the Parliament you can come back to Sri Lanka and contest the election. SL Tamils badly needs clowns like you. Well, thats the thing. Even that accord is flawed. Tamils are recent arrivals with the British. JR -Rajiv Feros Khan agreement was signed without consulting Tamils who are the real players ,…and forced on to them this is why LTTE opposed this ..
indeed this half educated Rajiv .Feroz Kahn who was parachuted to PM chair from pilot cockpit was so arrogant and foolish ….this is why he lost his life. Indeed an independent international commission can expose the real killers of the son of Feroz Kahn. Indira Feros Kahn lost her life because of her arrogance and Rajiv Feroz Khan lost his life due to his own foolishness ..
A good retort by Naga , it is also relevant to reimnd Eelaventhan when he was hiding in Tamil Nadu during Jayalalitha’s tenure as CM that she refused to permit visa for invitees like the late Prof Sivathamby and certain other Sri Lankan Tamil scholars from attending the International Tamil Conference because she considered there are no Tamils qualified enough to attend from SL. Did Eelaventhan protest about that then, with his side kick Vaiko with whom he had many things common? Jayalalitha is a boorish, corrupt , imperious swollen headed type of woman who is being tolerated by lumpen Tamil elements with even less than 79% intelligence in Tamil Nadu, which is another curse for all Tamilians. Mahinda Rajapaksa is a boorish, corrupt, imperious swollen headed type of man who is being tolerated by lumpen Sri Lankans with even less than 55% intelligence in Sri Lanka, which is another curse for all Sri Lankans. I endorse Naga’s comment, with some reservations. I wonder whether JRJ sabotaged the original intent of the 13th amendment through various manipulations. It was not what was expected in toto. Further, did the Indians participate in the formulation ofthe 13th amendment, as agreed. However, we could have progressed even with the 13th amendment as formulated, if not for the LTTE role and the subsequent gutting of its core by successive SL governments. The question whether the LTTE reactions, gave JR the influence to manipulate Rajiv Gandhi. It was not a path to Tamil Eelam as many allege. The 13th amendment did not pave the way for even what the states in India enjoy! This was another bogey by those opposed to any form of power sharing within Sri Lanka. The faith placed on the mercurial and totally unreliable Amma by Eelaventhan surprises me. Amma needs the SL Tamils to enhance her political image, more than we need her! Alithough I do not agree with the above article, please note that the Tamils are not recent arrivals. The Mahavamsa mentions the Dhamila people many times. It is the tea plantation Tamils who are of recent origin. To all Sri Lankans, Please unite instead of dividing, it is the only way forward. Granted they are not recent arrivals. The problem is more than 50% of them now live outside North and East. So there cannot be any kind of devolution of political power to North and East without any practical plan to physically move all the Tamil speaking people in the South to North and East. Simply stated if those in the North and East want a mono ethnic area we Sinhalese too want the rest of the area mono ethnic. Soma, I get your message. You do have a point…I beleive that all Sri Lankans have a right to choose where they live or relocate. Even within devolution this is possible. Quite a number of countries like Germany where the Bavarians have a proud identity live with other Germanic communities from the North who have settled down ther for carrier or other reasons. There has to be give and take from all sides. If you look objectively into our History you will see that there has been intermixing between the Sinhlese and Tamils. Both, including the majority of our Moslem brethren have there ancient roots in India. I beleive that we as a nation have to promote a collective identity while keeping our Singhalese, Tamil, Muslim, Burgher, etc, culture. This is what makes Sri Lanka so special. If, we realize this dream, then we are truly a nation. If you take out “Even within devolution this is possible.” I agree with you word to word. We Sinhalese can agree only for one of the two – No devolution and Sri Lanka is common to all or North/East to ALL Tamil speaking people and the rest for Sinhalese only. Any argument concocted to justify leaving 50+% Tamil speaking people among discriminatory, genocidal Sinhalese Buddhists are the very same arguments to justify that no devolution to North/East is necessary or practical and is an unjust demand. Despite the hollowness of your argument, you keep parrotting that there cannot be any kind of devolution of political power to North and East, without any practical plan to physically move the Tamils in the South to North and East. 1) You don’t have to have a plan to move the Tamil speaking people in the South to North and East. They will move, of their own will and volition, once political powers are devolved. 2) Should you need assurances, would you arrange for a referendum among them, even prior to devolution. I have been suggesting this to you for years now. Either, arrange for a referendum, or, halt your provocation. It is a good suggestion. Followed by some international guarantees. Mr Nathan, why don’t you, in collaboration with TNA, launch an active campaign encouraging Tamil speaking people in the south to move towards North/East? Any argument concocted to justify leaving 50+% Tamil speaking people among discriminatory, genocidal Sinhalese Buddhists are the very same arguments to justify that no devolution to North/East is necessary. Don’t ask questions for which you already know the answers. I lived and studied in Colombo. I was sent packing to Jaffna during the riots of 1958. Thereafter, I lived and studied in Jaffna. I lived and worked in Colombo. Wigneswaran and Sumanthiran lived and worked in Colombo. They still do. The South deprive North of livelihood. The South deprive North of personal safety. When ‘sole representative’ ran a separate administration the South kept on bombing North. There was no guarantee of life. We need not do any campaign to get Tamils move North. Tamils will move themselves North, the same way they moved themselves South. Don’t beat about the bush. Don’t be evasive. Hold the referendum that will resolve your fears. I am agreeable for a referendum provided “yes” for a federal unit for North and East should entail the condition that ALL Tamil speaking people in the south should be moved to North and East IRESPECTIVE OF THEIR RELIGION. When N-E is a separate Tamil unit there is no need for other Tamils in South to migrate there .. Reality is once there is a solution then Sinhala political circus will run out of stuff to play politics ..even their own people won’t believe them .. This is the reason since 1948 they are marketing Buddhism and Sinhala only racist technique ..
Jayalalitha’s guru (MGR) was the man who trained the LTTE and then India washed their hands off our problem. Now you want to bring India again! Please let a solution come by talks of all parties within Sri Lanka. When is the TGTE going to move their headquarters to Jaffna and fight for the rights of Tamils from within Sri Lanka? Who is your representative in Sri Lanka? The 13th Amendment, which was the outcome of the Indo-Sri Lanka Peace Accord, has already tied down the entire Sri Lankans. Had the 13th Amendment been implemented in its true perspective, there would have been co-existence within the provinces and broader vision of life among the people. Even the existence of the LTTE would have disappeared gradually. Even Jayalalitha wanted an Federal flavour so that the Sinhalese, Tamils, and the Muslims can live together on a mutual understanding. The Indo-Sri Lanka Peace Accord is binding for all purposes and cannot be abrogated by Sri Lanka alone. Moreover, the Peace Accord was signed to monitor the activities of Wahabbism which cannot be denied. Aah! majestic Jayalalitha. The lady is like the the good ship Queen Mary, sailing serenely through the turbulent seas of Tamil Nadu and Mother India; proud and unsinkable. But Sir, let us be clear on one thing, not John, not David, not Modi, not Xi, and, least of all, the politicians of Tamil Nadu will bring about change in Sri Lanka. Reconciliation, a lasting peace, and a new society in our blessed land will be rebuilt by the people of all those communities that have been destined to inhabit and share this land. The rebuilding will be long and tortuous but it will come one day; preferably sooner, but later for sure. One thing for certain; it would be disastrous to return to the strategy that failed. That tactic must remain dead and buried in the sands of Nandikadal. Sir, you are right about the Tamil people being well informed. But we must let Wiggie, Sampanthan et al make their way as best they can given the ground realities of life in the new SL. The cheer leading and long distance advice of the ‘diaspora’ is well and good but a better tactic would be to give constructive support to those of the community IN Sri Lanka who are involved in rebuilding and taking the community forward. Sir, you have had a good knock, fought the good fight. Relax in your most comfortable chair, remember the snuff, and don’t forget to take the tablets. Now, let the young generation have their turn in building a better world. Relax.The argument of Soma is like that of school kids.If you show yours I WILL SHOW MINE! As for Vibushana,he has to be taken not with a pinch of salt but with Tons of Salt! If you want to see mine you have to show yours. Nevertheless, the Sinhala/Buddhists are fighting to build a Sinhala/Buddhist ghetto in the Indian ocean which should continue to bother you. Of course you are a proud people hence you don’t need external help however you need to consider repaying all the financial, material and political support you received from numerous countries, some of them are dubious anyway, particularly Hindian money which sustained the economy of this island during the war and since. You should also consider repaying Hindians the cost of building houses in the North and elsewhere. Of course the people from the North know what is truth as they have themselves experienced the brutality of the state and its armed forces. They also remember 1958, 1977, and 1983. Sinhala people may not be ruthless but the Sinhala/Buddhists are. The people from the North had seen it all and heard about the brutality on both sides, JVP and the state’s repression. This is another ploy to justify an emerging Sinhala/Buddhist ghetto. Integration will only work when the constitution recognizes the diversity of the people of this island, not when preference is given to one particular religion in the constitution. Only because they were denied development in those areas where Tamils traditionally lived and they were forced to escape from brutal war. By the way the upcountry Tamils also live in Majority Sinhala populated land, how have they done in the last 150 or so years? Illusion is also defined as a false idea or belief. Whether Sinhalese like it or not JAYALALITHA is going to be a powerful political force soon not only in India but also in this region..this is certain..
She is the only leader today in India having full support in her state ..well experienced…proficient in many languages..with excellent administrative skills.. Tomorrow if she dissolve the assembly and call the election she can easily sweet 234 seats …easily..
Don’t under estimate this woman..
he he he Greater China is going to open deputy high commission soon in Chennai and this will be staffed by Tamil speaking Chinese diplomates …in hundreds..
Don`t underestimate Greater China because of the sweet words of uncle Sam..
Ashok thangavelu what you say is true. People living in Sri Lanka are living happily and the government is looking after all of them. It is only the diaspora tamils who are trying to promote some conflicts here because it is only then that they can continue their collections of dollars. If any tamils living in Sri Lanka believe that the diaspora tamils are going to come and invest in the North after they get a separate state they must be dreaming. Like someone mentioned here then the TGTE bigwigs should come back and set up office in Jaffna for a start. What they want is to have a problem here with the sinhalese down south and then they will talk about the genocide of tamils by the sinhalese and start collecting money from the develped countries and all the tamils living there. If tamils living in sri lanka do not know the diaspora is so rich that they move around in their private planes with the money they have collected because of this problem. If the problem is solved their collections stop. So all tamils living in Sri Lanka please be aware of their plan.